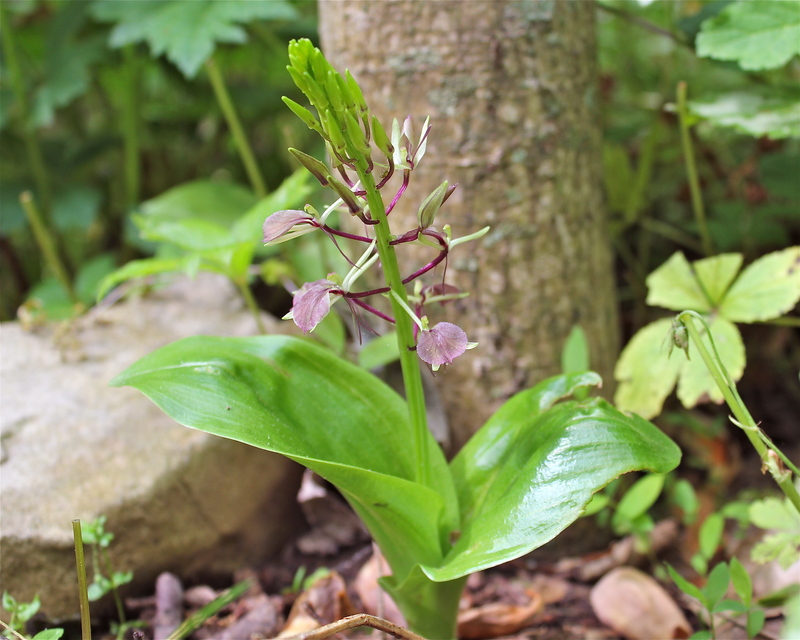 This inconspicuous, native orchid blooms in May and June. Each plant grows from a new underground corm; the previous year’s corm withers away. Two oval, waxy leaves emerge in April and eventually reach 4 to 6 inches in height. The small flowers begin to form in May, and are clustered on a single stalk. Note in the picture above how they open from the bottom of the stalk first. The flowers are so delicate that in order to appreciate them, you really need to get down on the ground to look closely. Twayblade flowers are irregular in shape; the overall form of the flower suggests a flying insect–maybe an ungainly crane fly. At a distance, the inflorescence appears pink to brown in color; up close, they are actually mauve, pale green and purple. So exotic!! Each small flower is held up by a dark purple stem. There are two green sepals and two lateral, purple petals that look like dangling threads. The most visible part of the flower is the wide, mauve-colored lip, which protrudes out toward the front of the flower. The genus name Liparis comes from the Greek word for fat or greasy, which may refer to the overly shiny surface of the leaf. Liliifolia refers to the oval shape of the leaves, which resembles plants in the lily family. Lily-leaved twayblade prefers mesic to moist deciduous forests, pine woods, and often disturbed habitats undergoing succession. The plant is distributed across much of the east coast, although it has been declared threatened, endangered, or “of concern” in some parts of its range. One of the plants in these photographs was found all by itself in a stand of young pines on my property in Montgomery County, VA. It flowered consistently for the last five years, but never set seed. I read that it needs cross-pollination by insects in order to reproduce sexually. June 29, 2014 Update: I found two more plants found in the Pandapas area in Montgomery County! Woohoo! Thanks go to John Ford for showing me their location! News Flash! 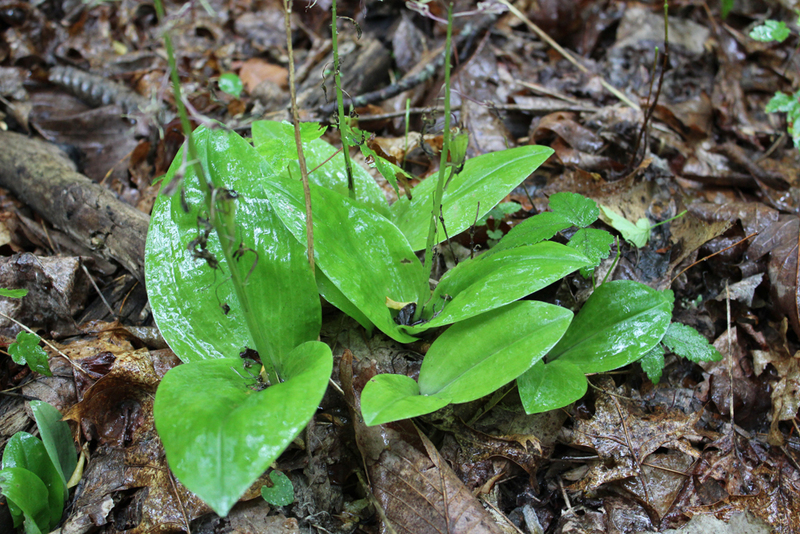 I just found a small patch of twayblade orchids in bloom at Carvin’s Cove on June 14, 2015! I found one and only one in Walnut Creek park, Charlottesville VA. Thanks for writing about it. I was thinking it was a liparis or listera so thanks for saving me steps. It looks to be in full bloom now. A small batch for years in James City Co (Williamsburg ). They seem to last for several years in one location and then disappear, only to find others several hundred yards away. May 21, 2017 – a few were in bloom on the Wahrari Nature Trail in Lanexa, Virginia, with ants in the flowers.